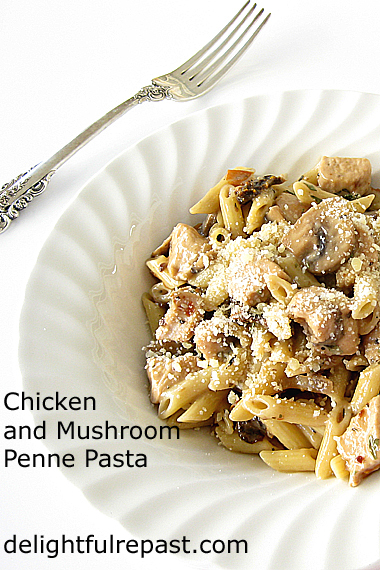 Chicken and Mushroom Penne Pasta is one of those dishes that’s special enough for company and easy enough for a weeknight family dinner. You can put all sorts of things into one of these dishes, but I like to really savor a few simple ingredients instead of throwing the kitchen sink at it. I made the batch pictured here with the smaller measure of sun-dried tomatoes and mushrooms, but I like it even better with the double amounts. If you use the larger amounts, do throw in an extra splash of brandy. So many creamy pasta recipes call for huge amounts of butter, cream and cheese – but you can get delicious results with far less. In fact, my recipe is made without any butter and cream at all and just a small amount of cheese. Sometimes I prefer just enough sauce to coat each bite of chicken and mushroom and each piece of pasta, as shown here. Other times I like to have more sauce, so I splash in the cream. It's very flexible. I think the dish is best with a ridged (rigate) tube pasta. Penne was my favorite until I met mini penne a few years ago. But either will do. Of course, it’s delightful with a red meat sauce, but I do love a creamy chicken pasta. 1 In 5-quart pan, bring 3 quarts of water with 1/2 tablespoon of salt to a full boil. While it’s heating up, make sauce. You will add the pasta to the boiling water about the same time you start cooking the chicken. But if the water is not up to a rapid boil by then, the sauce can sit quite happily. 2 In 12-inch straight-sided* skillet, heat 1 tablespoon of the olive oil and saute the onion while you slice and hydrate the sun-dried tomatoes and slice the mushrooms. * If your 12-inch skillet is not straight-sided, you’ll need to cook the chicken in two batches. So if you have a straight-sided one, use it. 3 Add the tomatoes to the skillet and cook for about a minute until the liquid evaporates, then add another tablespoon of oil, mushrooms and 1/4 teaspoon each salt and pepper. Cook over high enough heat to make the mushrooms sizzle, stirring occasionally, until the mushrooms are done, about 6 to 10 minutes. Remove vegetables to a bowl. 4 Add 2 tablespoons oil to skillet and cook the chicken, seasoned with 1/2 teaspoon each salt and pepper, over medium-high heat, stirring frequently, until lightly browned and cooked through. Deglaze the pan by stirring in the brandy and scraping up any browned bits. Add the milk and the slurry of flour and water, cooking and stirring until thickened. Stir in the basil, thyme, red pepper and Parmesan. 5 Drain the pasta, reserving a cup of the pasta water in case your sauce needs thinning. Stir the drained pasta into the sauce. Taste and adjust seasoning. As much as I love creamy pasta, I can't handle too much cheese and cream well. This one looks creamy without way too much fat and cream...perfect! Thanks, Angie. So many times when I order a dish like this in a restaurant, it's just drowning in fat. I love, butter, cream and cheese, but it can definitely be overdone! Jean, the pairing of pasta and mushrooms is perfection! I am saving your recipe...we do love pasta at our house! Thanks, Sully, for that palate/pallet thing! Yep, give this a try for your next starch craving. Makes a nice change from the red. I was just getting ready to satisfy my starch craving with a slice of homemade sourdough bread, toasted, with butter and raspberry jam. Thank you, Pam. I hope your family will like it as much as we do. The well-cooked onion is in just the right amount to supply those caramelized notes without overpowering the mushrooms. I like the mushrooms to be the star of anything I put them in! Cindy, thank you. AND for the Pin - social media shares are always much appreciated! Yummm! That sounds delicious! Thanks for visiting me. The quote on tea, which you are printing, really was a special one for sure. I am going to read it to my tea group the next time we gather too. Thanks, Marilyn! And your tea group is going to love that quote! Mmmmm I love mushrooms in dishes, Jean, and this one sounds so tasty with all the herbs and sun dried tomatoes. This is a must try. Thanks for sharing your recipe, Jean. Thank you, Greg! Means a lot coming from a guy who makes such pretty food himself! Christine, that is sad! Maybe you should make yourself your own little batch for a solo midnight snack! Kitty, thank you. Let me know how you like it! Thanks, Maristella! And hugs to you, my dear! I think I might have most of the ingredients for this! It may go to the top of the dining queue! Jeanie, that's super! Do let me know how it turns out for you. Thanks for sharing another tasty recipe, Jean! I've always preferred creamy pasta over pasta with tomato sauce. Thanks, Margie! I've always liked both, but lately I've been wanting the "white" pastas more often than the "red." Thanks, Judy! I like Tinkyada GF pastas, too. The leftover brandy? ;-) I put it in lots of stuff. I don't really like to drink it, except in eggnog, but I use it a lot in cooking. Thank you for this vicarious dose of comfort. Aaw, Pauline, wish I could teleport a plate right over to you! But a "vicarious dose of comfort" can be very nice! Oh, it does look like an extra special dish!! I love the mushrooms in it. Mushrooms give so much flavor to any meal. The ridged tube pasta really holds the sauce, that's why a lot of times I prefer the short pasta to the strands. Strands can be dangerous as they whip around and slap you on the face. :-) I've pinned the recipe. Have a great weekend. Thank you, Martha. I hope you'll try it soon and let me know how it turned out. Thanks, Marisa, AND for the Pin. Strands are definitely dangerous to my clothes - I'm much more likely to splash sauce on myself! But I rarely have it because Mr Delightful prefers short pasta. Pinning this - it looks so good! I can't have the pasta but I use zucchini noodles now in place of the pasta and am always looking for good sauces to serve over them. Lauren, thank you. Zucchini is a wonderful pasta substitute, or you could try this sauce on a cooked slice of eggplant or a bed of mashed potatoes (I love mashed potatoes!). Wow, there's a lot of great ingredients n this one. Brandy and sun-dried tomatoes are just a couple that make this especially interesting. Pinning. Thanks, Leanne. I've always used a lot of brandy in cooking. And sun-dried tomatoes always make Mr Delightful happy! Thank you, Tony. Yes, I think dishes sometimes taste different with different pastas and, as you said, the different textures create different eating sensations. Your kitchen must be smelling wonderful right now! I bake my fruitcake at 135C, but that's just me. Perfect! I'll sub in the rabbit I've already started & this is what's for dinner tonight. Can hardly wait. Wow! Mrs Shoes, is it one of those things that "tastes like chicken"? Let me know how it turns out! Looks and sounds wonderfully delicious! I'll have to print it out and keep it tucked in my folder where I keep all my "to do soon" recipes! Thanks, Richard! Do let me know how it turns out for you. This looks SOO good! I agree that ribbed pasta is better too. Your directions are always perfect, and make me want to eat some now! Have a lovely weekend! Marilyn, thank you so much. Especially about my directions - that's important to me! It looks just right and delicious. Thanks for the recipe! I'm glad you like it, Ellen! Thanks, David! Pasta is something we never tire of either. This looks so good. I a pinning it. Thanks, Barbara. Pins are always appreciated! Thank you, Linda. And for hosting DIDI. Such fun. We will love your Pasta dish, it looks delicious! Hope you are having a great week and thanks so much for sharing with us at Full Plate Thursday! Thanks so much, Miz Helen. See you Thursday! This looks insanely delicious. 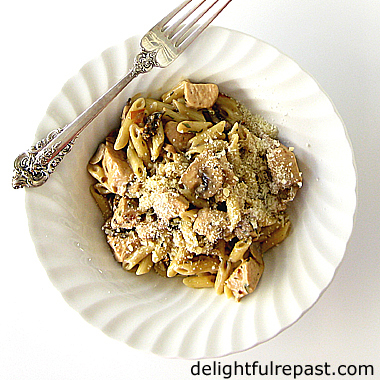 Chicken and mushroom are two of my favorite add ins for the pasta. This looks yummy! Thank you for sharing with The Blogging Grandmothers. I have shared on Social Media. Thank you, Clearissa! Social Media shares are always soooo appreciated. This looks delicious, as it is, amd I wonder how it would be with salmon. I am going to try it. Oooh, do let me know how it turns out with salmon! Great idea!